At the NW Chocolate Festival I met the most charming couple from Brazil. Pedro Caetano Magalhales Neto and his lovely wife. Pedro's family has had a cacao farm in Brazil for generations. After combing through their web site and the gorgeous photos of the land I can hardly wait for an opportunity to visit his farm. 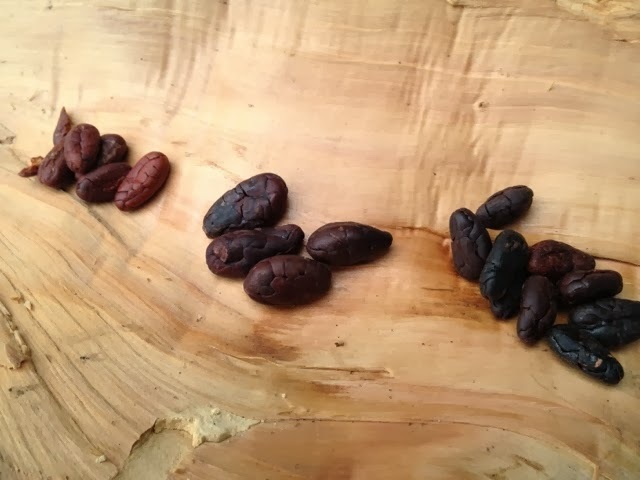 Pedro gave me some cacao beans that he called "nibs" like I have never seen before. These "nibs" were roasted, fully in tact beans with the shell removed, all ready to eat. Catongo. Pedro says this is a white bean before it is roasted. After roasting it appears red in the photos and has a bright fruity taste. I imagine it would have some serious red fruit flavors if made into chocolate. Trinitario. The largest bean in the photos and has some flavors that I just can't place. Perhaps Pedro will be kind enough to do a Google Hangout with us sometime and explain what I am tasting. Foresterio. The smaller dark bean in the photos. These beans either had quite a dark roast or notes that remind me of strong dark coffee. I'd love to hear more from Pedro about the roast of these beans too. Right now these beans aren't available in the USA (except at my home and I'm guarding my stash carefully), however. Pedro is interested in offering them here in some form, either the beans or perhaps as a chocolate bar. My questions to you, my chocolate loving friends, are you interested in beans such as these? I'm curious, am I such a chocolate geek that I am the only one eating straight beans? If you are serious enough I can put you in touch with Pedro. 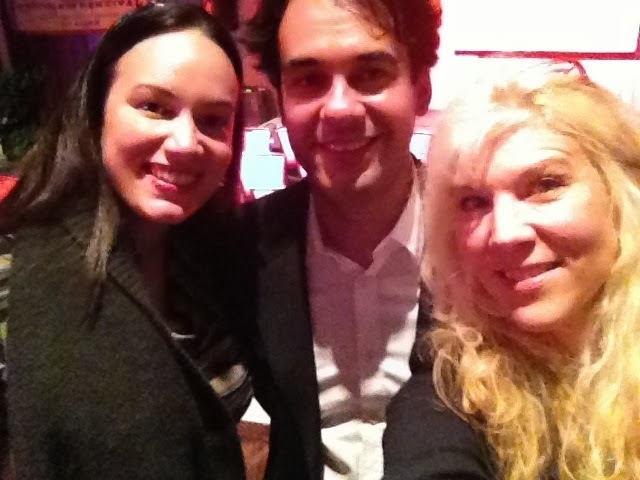 Pedro and his lovely wife were kind enough to share a photo with me at the NW Chocolate Festival. 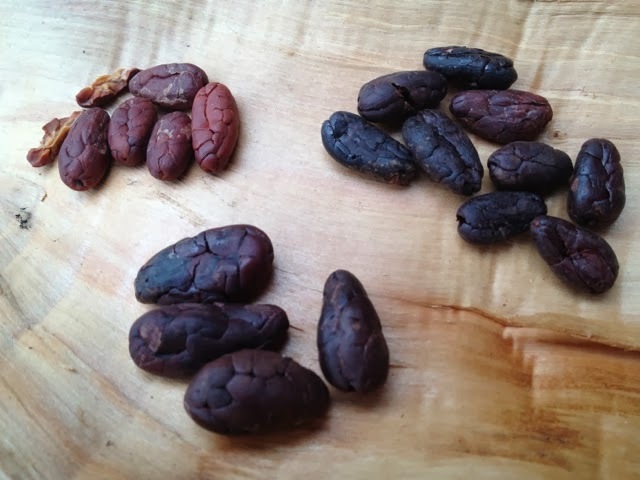 A quick video about the cacao beans. I am VERY interested in trying those beans!! I would love to see the differences in the 3 types with my own eyes, then compare the tastes with my own tongue. I have never seen or even heard of whole beans with the shells removed. I would like to see how they do it. The only way I can imagine is 1 bean at a time. 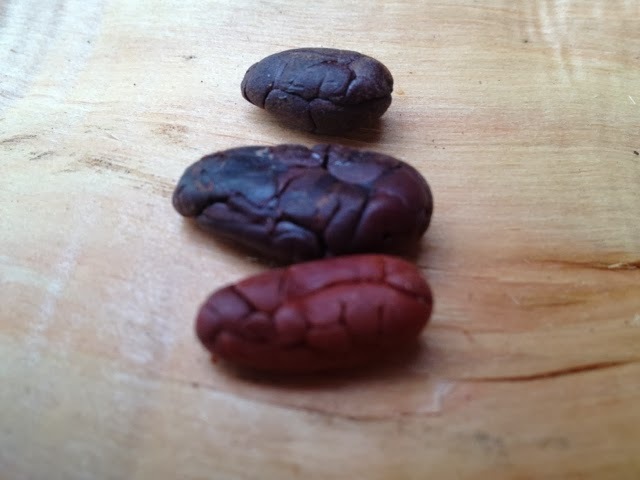 Even when I have taken the shell off of 1 roasted cacao bean the bean always breaks apart. I would definitely buy some to show others in my tasting classes!